We’re off to a great start. Most important, everyone got here — a circumstance not to be taken for granted given how many of us were flying from the east coast. Following quick introductions, we hopped into our nimble little bus and drove the five minutes to Carter Lake. It took even less time to find our target, the Harris sparrows at the only feeder in town. We’ll see more, perhaps many more, but it’s a grand bird to start the tour with, a lifebird for several of us, even. Then across the Missouri to Lake Manawa, where got to practice our scaup identification (all lessers today) and admire the courtship antics of common goldeneye. 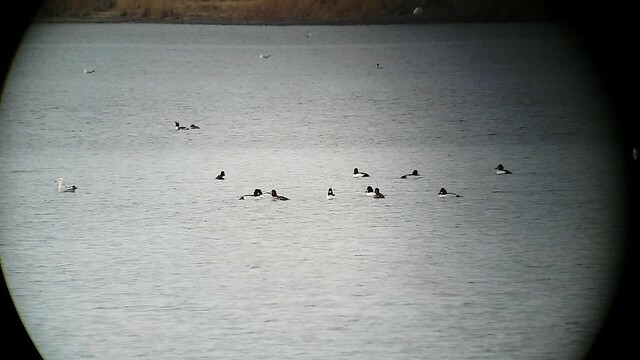 Lesser scaup and common merganser were the most common birds on the lake, but scanning carefully gave a nice head start to what is likely to be a very complete anatid list this week. 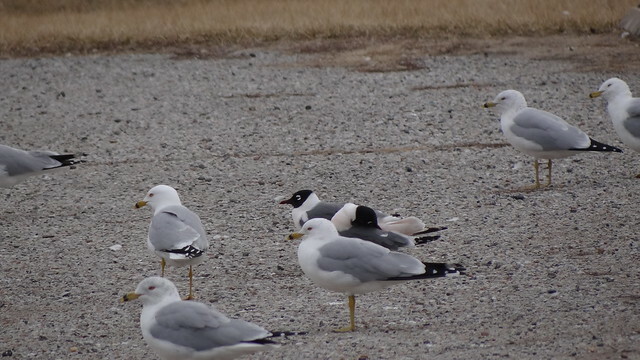 I was happiest to see that the Franklin gull count had risen to a good score of birds, including several loafing on the pavement at one of the pulloffs. Another lifer for a couple of the group, and even those of us who had seen hundreds and thousands of them over the years couldn’t fail to be enchanted by this graceful gull and pink. Daylight saving time falls awkwardly this year, so we pulled ourselves away from the lake for an early supper at La Mesa, excellent as usual. We got back to Manawa with some time to scan the big, and ever bigger, gull roost on the lake. Danny found what struck me as likely a first-cycle Thayer’s gull, with neatly patterned plumage and apparently not quite black wing tips; had it been half a mile closer it would have made the day’s list. Easier to identify was an adult lesser black-backed gull, expected nowadays but always exciting. As the sun was getting dangerously close to the western horizon, we drove on to my favorite woodcock spot. 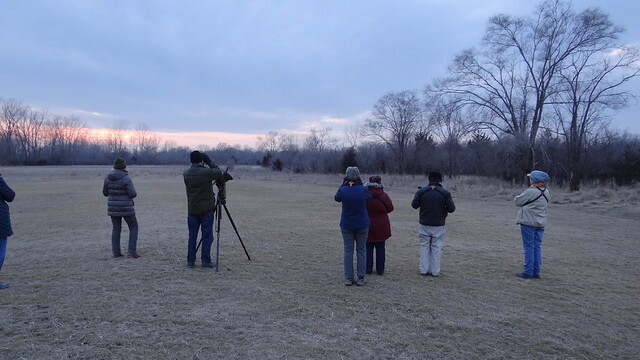 It wasn’t outstanding this evening — too much noise from that horrible power plant — but we heard probably three birds buzzing and had good sustained looks at one in display flight against the blue and pink sky. Snow geese were passing almost continuously overhead, and one of the closer flocks had a couple of Ross geese, the first of what I suspect will be good numbers this coming week. We were back at the hotel at 7:30, happy with the day and eager for tomorrow. Feeling good about this tour! But he worked inside, too. 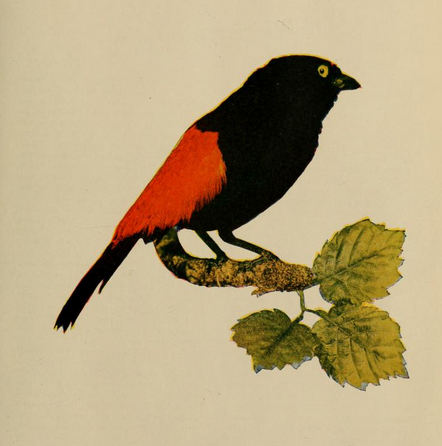 In 1891, when he was 26 years old, Cherrie discovered and described a new species of tanager in the collections of the Costa Rica National Museum. 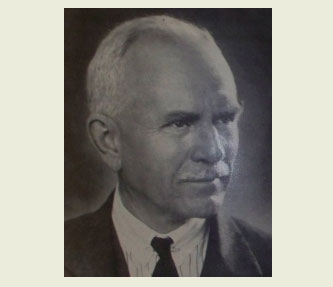 The six specimens –which seem to be no longer in San José — had been collected a few years earlier by none other than José C. Zeledón. Cherrie’s new tanager has had its taxonomic ups and downs, but Ramphocelus costaricensis is once again recognized as a full species distinct from the Passerini’s. And once again we call Cherrie’s tanager the Cherrie’s tanager. as worthy as the species’ discoverer is of his own place of honor among American collectors and ornithologists. 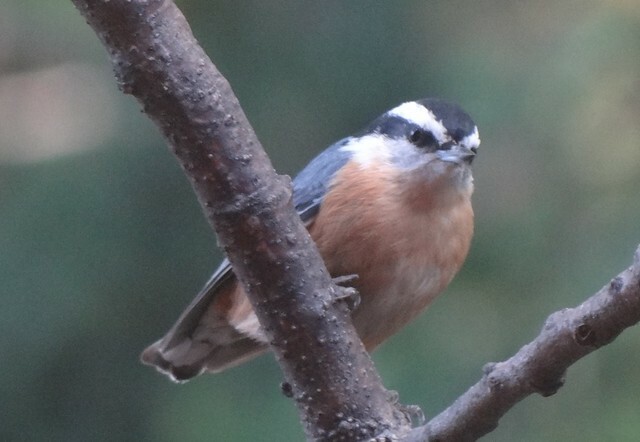 Our insatiable hordes of gobbling Pine Siskins have pretty much moved on, greatly to the relief of our savings account, but we’re still enjoying the sweet little Red-breasted Nuthatches that seem to have settled in for the season. They’re no less ravenous than the streaky finches, and every bit as tame. I can hardly rehang the feeder before one of the little tooters lights on it, and it’s just a matter of time before they start landing on me, too. Lots of backyard birders in the east have been taking advantage of the birds’ tameness this fall to train them to take food from the hand. I disapprove, in my puritanically strict hands-offitude, but the dozens upon dozens of accounts of hand-feeding I’ve read over the past couple of months got me to wondering: who first figured out that you could coax wild birds to take sunflower seed directly from a human? There’s probably no answer to that, at least not until we’ve identified the original domesticator of the chicken. Meanwhile, though, let me introduce you to young Harriet Kinsley of McGregor, Iowa. Wilson Bulletin 27.2 (1912): 314.
a bluish slate-colored back with black stripes running back above each eye and the breast tinged with rufous. One day my mother thought she would put a nut meat on her hand and see how near he would come to it. He wanted the nut very much, but was a little shy about coming down to get it ; he scolded, cocking his head first on one side and then on the other. The temptation was too great; he would risk his life: he made a swoop, lighting on her hand, and away he went with the nut. The next day we all tried the same thing and found he would take them after a great deal of scolding. We fed him every day and he gradually grew less timid. “Less timid” indeed: Harriet’s account, published in the Wilson Bulletin, makes it sound like the family was terrorized by the sharp-billed little beast. He started to demand to be fed — and only butternuts, if you please, no black walnuts — perching on doors and window sills to look into the house. We had to keep little piles of nuts by several of the windows so we would not have to go so far. The Kinsley family’s servitude lasted all through the winter, ending only on March 31, 1913, when their importunate guest finally flew north. And what about Harriet? 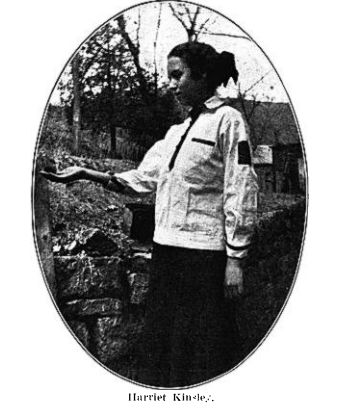 Even in those more relaxed days a century ago, when the Wilson Ornithological Club was still pronouncedly regional and midwestern in its “flavor,” it was remarkable to find a Campfire Girl publishing in the pages of the Wilson Bulletin. She is still listed as a member of the Club in 1917, but disappears from the rolls by 1920. No doubt the responsibilities of adulthood had set in by then, taking up the time that she had spent as a girl watching the bird tables. Before life caught up with her (she married Roy Neff, the principal of McGregor High School in 1929), though, Harriet had almost certainly had contact with two of twentieth-century Iowa’s prominent ornithological observers — both of them fellow members of the Wilson Club. I don’t know whether Mary Hatch was also a Campfire Girl, but both young women must have found inspiration in the bird studies of their famous neighbor in National (she received her mail in McGregor), Althea Sherman. whose habitat is in deep, wooded ravines, [and is] very rarely … seen upon the prairie. To have one come in mid-winter, find food, even to visit the feeding-stick and linger around for three weeks, was as pleasant as it was unexpected. Sherman’s mention of “many experiments … made to learn the winter bird boarders’ choice in foods” recalls — and may well have inspired — Harriet Kinsley’s offering her tame nuthatch a choice between butternuts and walnuts. I am still in search of the missing link (nowadays I think we’d call it the missing url) to establish the connection between Harriet, Mary, and Althea Sherman, but their experiences and their writings suggest that McGregor, Iowa, a little town on the Mississippi, was the place to be a hundred years ago, in the nuthatch winter of 1912.